How much does it cost to hire the Paladins of Chivalry? We charge a very reasonable basic daily rate, which includes our encampment, costumed re-enactors, and set-piece displays as required (see "What will I get for my money?" below for details). Our rates are very competitive but reflect the value of our equipment and the experience and knowledge of our members. Contact us to discuss your requirements and obtain a price for your event. Our daily rate includes a full medieval tented encampment, with working kitchen and tents furnished with historically-accurate furniture and equipment. Members of the public will be invited into the open tents to look round, handle equipment and interact with the occupants. Displays of "living history" will be going on throughout the day, and might include a group of cooks preparing a meal, musicians entertaining a party of nobles, an armourer repairing or polishing armour, noble ladies occupied in sewing and embroidery, an apothecary plying her trade and men-at-arms gambling and telling tall stories. Truly a unique insight into the medieval period! In addition, we can offer several set-piece displays, each lasting 20-25 minutes, such as a dance and fashion show or a banqueting display (see "What show formats do you offer?" below for details). We can also offer smaller-scale talks on many other aspects of medieval life. What are the benefits of hiring the Paladins of Chivalry for my event? It is well-known in the heritage industry that costumed interpreters play an important role in bringing to life an historical event. Members of the public enjoy a unique opportunity to interact with knowledgeable interpreters and gain a fascinating insight into the medieval world. The Paladins of Chivalry are not actors reading from scripts; we have an immense wealth of knowledge and research about the medieval period and are able to impart this effectively and often entertainingly! For children in particular, the chance to try on a knight's helmet or handle a sword (in a supervised manner! ), or to try their hand at grinding corn to make bread, or spices for the pot, can bring history to life in a way that no textbook can. The Paladins are highly-esteemed within the heritage industry and feature regularly at showcase events such as English Heritage's "Festival of History". We will bring our high standards of historical accuracy and performance to give a great visitor experience at your event. We are professional in our outlook, flexible in our approach and we pride ourselves on delivering client satisfaction and meeting the specific needs of each client, whether you require a small group of specific interpreters or a larger-scale display of medieval life. What do the Paladins of Chivalry need in order to perform? Our needs are quite simple! We require a flat grassed area of sufficient size for us to set up our tents, and vehicle access to this site. We prefer to perform within our encampment, so this area needs to include sufficient space for an arena which must be bordered with a double-roped barrier incorporating a "dead zone" of 1m (we can supply the ropes and fencing). We need also access to toilets, drinking water and electricity, and we need seasoned wood or charcoal to fuel our kitchen. What safeguards can you offer me? The Paladins of Chivalry have Public Liability insurance to the value of £5 million, and we pride ourselves on our excellent safety record. All members taking part in combat displays are regularly assessed for competency and safety, and these assessments are recorded. We have full Risk Assessments for our encampment and for the displays and activities that take place within it, and copies of these Risk Assessments will be provided. We also have a comprehensive Child Protection policy. The medieval world was a hazardous place but we minimise any risks as far as humanly possible: any potentially dangerous areas or activities (such as the kitchen fire) will be roped off to prevent public access, and our kitchen range conforms to English Heritage requirements to avoid damage to expensive lawns. We also have a fire point within our encampment. If the weather is inclement, we will always do our best to provide the agreed displays, except where the conditions would render some activities unsafe, in which case we will work with you to provide an alternative display. Finally, in order to safeguard both parties, we ask that a contract is signed and a deposit provided in advance of the event. How far in advance do I need to book the Paladins? If you are interested in booking the Paladins of Chivalry, please contact us as far in advance of your event as possible, as our calendar is quickly filled! We are available for bookings all year round, although our encampment will not usually be available over the winter months (October - March); however, we can usually work within your venue if you would like to book us for a winter event. We are busiest in July and August. Please note that members of the Paladins are volunteers and most are in full-time employment, so we can usually only perform at weekends. If you would like to book us for a weekday, however, please do contact us as we will do our best to help. You can contact the Paladins Event Manager by telephone on 07919 348620 to discuss your event requirements, or use our contact form. What show formats do you offer? The Paladins of Chivalry can offer a wide and varied range of show formats. Our standard format is three twenty minute shows per day, which would usually include a Dance show, an 'Arming-a-knight' display, and a Tourney, culminating in a Grand Melee. If what you are seeking is not described below, contact us, we are versatile and able to adjust to your needs. We can supply equipment and clothing for dressing a mannequin, or performers in armour or authentic clothing to add flavour to your event or function. Costs do vary, as our costume and equipment is expensive to make or buy, so please discuss your individual requirements with our Events Manager. A refundable deposit will be charged for all items provided, and we will expect that items be stored securely and adequate insurances held by the client. Please note that we are unable to guarantee size or fit of costume or armour, as these outfits are made for individual members of the group and are not generically-sized. Kindly also note that, for reasons of safety, we are not able to hire out weapons. We can provide members in authentic costumes to perform and teach medieval dance. A typical dance display lasts around half an hour and consists of 4 or 5 dances. 4-8 dancing couples are present, most of whom wear courtly costume. We include both courtly and peasant dances. The dances are based on visual, musical and other references from the 14th and 15th centuries, and a few are taken from a 16th-century work by Thoinot Arbeau. A costumed narrator will explain a little about each dance, and towards the end of the display the audience will be invited to join us! The music is performed by the musicians within the group playing reproduction medieval instruments. Please note that sometimes we may use a recording, but wherever possible live music will be provided. This show would ideally precede the Tourney, and can sometimes link directly into it. During the show the fighters are gradually armed, piece-by-piece, with the armour and weapons being described by the narrator. There is a short weapons demonstration at the end. The armour will be laid out for the audience to view, and our knowledgeable narrator will explain the history, style, manufacture and particular attributes of each piece of armour as the show progresses. The Paladins will display knights in full harnesses, as well as an assortment of lightly-armoured fighters. The display will be carried out either in a central arena (using microphone), with the fighters arrayed around the edges close to the crowd, or outside the knights' tents. In the latter case, each knight, with his squire, will attract and entertain his own audience (microphones cannot be used). This format can range from a pair of knights for a single combat, or many combatants without an encampment. The small tourney format assumes that the performers require no setup or equipment other than that which they wear. This is where we excel. Normally commissioned for an entire day, the large tourney format includes a complete 14th century encampment, tentage, tables, ladies of the court, and retainers. This allows the public, or your clients, to wander through the encampment to observe and discuss aspects of the medieval noble classes at play. Due to the remarkable range of skills and resources within the Paladins, we can also offer a number of different displays, for instance: archery, cookery displays, talks on costume or heraldry and many more. Shows can also be shortened or extended; anything from 15 minutes to over an hour would be possible, although longer shows would have to be discussed in advance. Do you cover other periods? 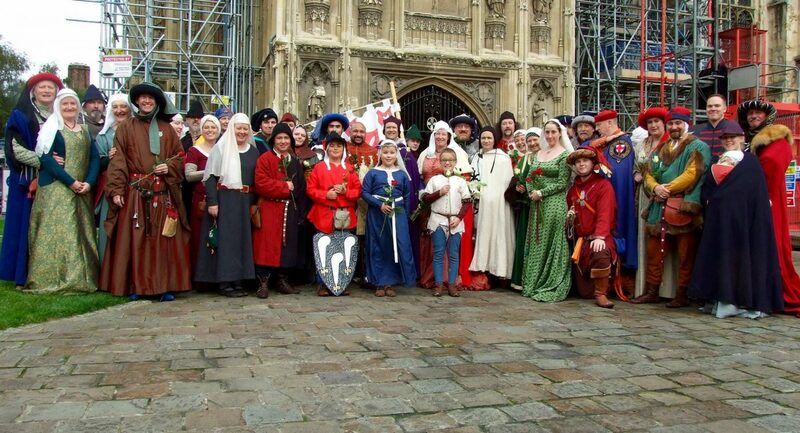 Although we are primarily a 14th century group, many of our members also take part in War of the Roses events. If you are considering stepping forward in time to the 15th century we are able to supply colour and combat to your event. What are you clients saying about you? "Many thanks for a wonderful weekend at Battle Abbey. I do hope that your group enjoyed themselves. I thoroughly enjoyed your presentation and I believe the crowd did too! It was a pleasure working with your group." "I'm so glad you enjoyed FOH - it was great having you there! Thanks for all your hard work over the two days - it is a tiring event!" "Thank you one and all for your efforts in making this a success and a fun show to boot." "From all at Davidson Primary School I would like to say thank you for the amazing performances and all the hard work you put into your shows. The children and parents loved it and we would love for you to come back again next year. THANK YOU, YOU ARE ALL FANTASTIC!" "Greetings to all the Paladins! We were fortunate enough to see you all at "The Gathering" at Banbury and we were both very impressed with your display, your characters and your camp! It was an absolute delight to hear the passion you obviously have for what you do and the chats we had with a number of your members were highly informative and entertaining. Top marks to you all!" "I just wanted to say a huge thank you to your group. You all worked so hard and continued to try to put an event on despite all the odds. I hope you made it home safely!" "Thanks to one and all who made the show such a success and look forward to our next adventure together in the future." "The Paladins provided a colourful and lively glimpse into the medieval world with a professional attitude and an eye for detail unmatched by other groups from the same era, I look forward to using them at another of our events soon." "Hope that you enjoyed the Festival, despite the intermittent rainfall! Having got back home on late Monday evening after getting another drenching clearing up, I saw the devastation due to flooding around the Country, and realised what an escape we all had! The show from the Guys & Girls of the Paladins was once again superb, and you nearly made me cry with admiration and heartfelt thanks on Sunday when I saw you performing in the rain to our visitors - FANTASTIC!" "Your group are the showcase Interpreters for my events when it comes to the medieval period." "I would like to say a huge thank you for working so hard over the weekend. I know the conditions were dreadful and in spite of this everyone kept going with big smiles and great enthusiasm. We welcomed over 7000 visitors over the three days which was amazing. Hope you have all dried out. See you at the next one!" What do the Paladins actually do? What is the club’s purpose? We are, first and foremost, a performance society. We are hired by heritage sites and event organisers to entertain and educate their visitors, and all our members are expected to take part. During an event, we provide static "living history" displays and live shows. We regularly meet for practice, but the main purpose is to help us prepare for the events: we are not a fencing club or a dance group. Our fighting style was developed for the stage and our tournaments are scripted; our members are welcome to train with other groups if they wish to fight competitively. £35 per adult for one year, £15 per child aged 13-16, and for children under 13 a token payment of £1 must be made. This entitles you to train at the club for a year and pays towards your insurance whilst at group events; also, at events most of the food is provided free of charge by the club. If you are on a low income, we can always be flexible, and you could for example make payment at £2 per week. Where are you based? Do you meet regularly? The Paladins are based in South West London. We train each Tuesday night from 8 - 10pm at Beverley Hall, 89-91 Grant Road, just off Lower Addiscombe Road in Croydon. As we have attracted several new members from outside the London area we also try to arrange at least one weekend training per month in the off season. Can I still join if I do not live close enough to train every Tuesday? Yes, of course. Our members are quite widely scattered, coming from as far afield as Hampshire, Kent, Buckinghamshire, Somerset and Leicestershire! We arrange several weekend training sessions each year for members who cannot train regularly at the club. Our events tend to be in the south-east, but usually you won't have to travel too far. Is re-enactment an expensive hobby? No more so than any other hobby which requires specialist equipment. We recommend that you outfit yourself in appropriate costume as soon as possible, although sometimes a limited amount of "loaner kit" may be available. If you can sew then you should be able to get the basic outfit for around £100. Not at all. We are open to people of all ages, backgrounds, races and abilities, and everyone has a valuable role to play and an important contribution to make. We do have some rules regarding behaviour but these are largely governed by common sense (i.e. you must not consume alcohol or smoke whilst on display to the public). We also have rules regarding historical accuracy to make sure our portrayal of a medieval household is as believable as possible. Our friendly Authenticity Officers will be very happy to help and advise you. Is re-enactment a family-friendly hobby? Definitely! We welcome families and children, and promise that you will all have a great time. We do have children within the group and they contribute a great deal to our portrayal of a medieval household. Re-enactment is a great way for kids to develop confidence, social and communication skills and to learn interesting and fun things, and schools are often very understanding and even enthusiastic about children taking part in medieval events. For legal reasons we require that any child under the age of 16 is accompanied at all times by a parent or guardian over the age of 18, and children under the age of 16 will not be able to take part in combat displays. Do I need to have any prior experience or specialist knowledge? No prior experience or historical knowledge is required in order to join. We ask that you have an interest in medieval history, but we can teach you everything else. At our training evenings you can learn dancing, sword-fighting and archery, and to gain help with costume and armour. If you do have experience in a related field such as martial arts then you may find this helpful, and if you are enjoy cooking or play a musical instrument, or have any skills such as leather-working, carpentry or sewing, then you will have ample opportunity to use them! What equipment do I need to start? All members wanting to participate at a Paladins show need a minimum amount of equipment. While often enough spare kit is brought to events and many people are more than happy to lend out their own equipment, it is of course not generally accepted to perform in borrowed gear for an ongoing time. There is plenty of help at hand to make your own clothing and maybe further items like pouches, belts and shoes. Should you prefer to buy your clothes and other equipment, then we can also provide help and assistance with traders and markets. The Paladins have a small number of spare weapons for training purposes if you wish to learn to fight, so with exception of some form of hand protection the above list should be your first priority. Please do not purchase or make anything without first having it approved by our Authenticity Officers, as it is much more costly to buy the wrong thing and then replace it, than to get it right in the first place! What will I have to do at events? Our goal is to portray an encampment of 14th century nobles and upper classes gathered to play. While some members portray exclusively nobility and gentlefolk, others also provide the necessary servants, craftspeople and professionals that would have been present. As a performance group, everybody tries to work together under the guidance of experienced members, to make an event enjoyable and informative. While we have several elements within our shows that we practise routinely, every show tends to be different and all elements can be adapted and changed according to our client's requirements. This is our hobby and we do this for fun, but regardless of our personal gain and interest, we also need to make our best efforts to present an organised and committed show. I’m not sure about “performing”, do I have to be able to act? Nobody will force you to "perform" if you aren't happy doing so. Not all of our members are drama queens or attention junkies! At our events there will inevitably be some interaction with the public (after all, we are there to entertain them) but you can limit this if you wish by, for example, portraying an attendant to a more experienced member who can field questions for you, or by helping in the kitchen where other kitchen staff can help you out. You will find that you very quickly pick up enough knowledge to carry on a conversation with a member of the public. Do I need to portray a particular character? We do ask that members construct themselves a "persona", i.e. your character will need a name, an occupation, and a reason for being included within our household. This helps to give you a focus to your research. Many members choose to portray an historical character, and spend time researching their life in order to portray them realistically, but this is not mandatory and you can often construct a simple but plausible character history from your own or a family name, connections within the group (e.g. family or spouse) and life experience. How is fighting practice organised? Combat training is supervised and conducted in a series of formulated steps to ease new members into a safe style without resorting to choreography. In order to be covered by insurance we have a ranking system similar to any other martial art system which enables new skills to be learnt only when a practitioner is deemed to have mastered all previous requirements. I’m female and I’d like to learn to sword-fight. Can I? Yes, of course! Most of our members learn to fight, but you will not be forced to fight if you do not wish to. Sword-fighting is accessible to everyone and a great way to keep fit and improve your posture, coordination and stamina. We are happy to train women to fight, although for reasons of historical accuracy you will not always be able to fight at events. If you do fight at an event, we require you to have male costume. Can my kids train to fight too? Please note that children under the age of 16 may only take part in training with written agreement from a parent or guardian, and with an appropriate adult present at all times, and they may not take part in fighting at events until their 16th birthday.